Airbus has launched the C Series jet – the wings of which are made in Belfast — in France, renaming it the A220. The European aerospace giant now has a 50.1% majority stake in the passenger jet formerly known as the C Series after a deal with its original owner Bombardier earlier this month. There are around 1,000 people in Bombardier Belfast out of a total workforce of 4,000 working on the A220 wings. 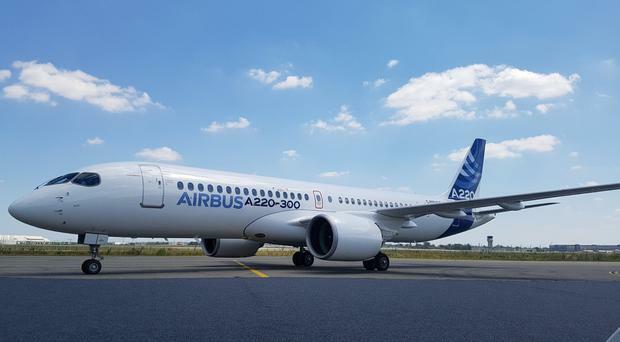 At a launch event in Toulouse on Tuesday morning, Airbus embarked on major drive to push sales of the A220 – saying the jet will fill the gap between the large single aisle and regional aircraft. And Airbus also trumpeted the lower cost per seat of the CS100 and CS300 compared to industry competitors. It said the A220 brought “lower weight, lower fuel burn and lower maintenance costs”.